Hi-Visibility Jacket. 7.5 oz. 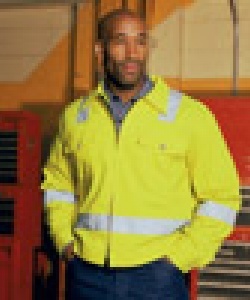 100% Polyester, Class 2 Level 2 compliant, 360 degree visibility. Unlined, 2\" silver striping over the shoulders, meeting one horizontal stripe around the body above the waist. Two button-thru flap pockets. Adjustable waist tabs, solid brass zipper.